Although lifestyles of consumers worldwide are getting busier and faster, and the market offers an extensive range of prepared and frozen food, the global market for canned tuna is projected to experience passive growth over the next few years. Growing consumer dependency on prepared and ready-to-eat food is considered to be a key driver to push the demand for canned tuna a little farther over 2017-2025. 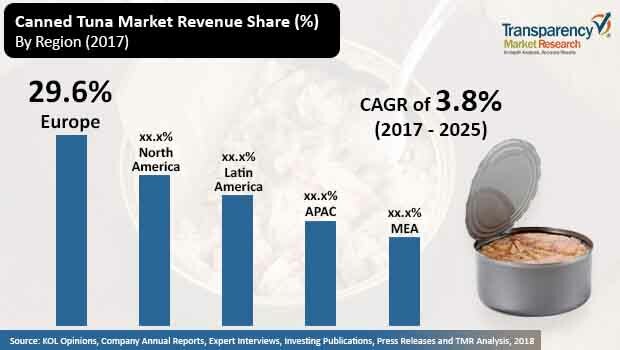 Global revenue of canned tuna market was around US$ 10,496.1 Mn in 2017, which is expected to increase at a CAGR of 3.8% over the forecast period, reaching a value worth US$ 14,125.5 Mn by the end of 2025. By species type, the global canned tuna market is segmented as albacore, skipjack tuna, yellowfin tuna, Bluefin tuna, bigeye tuna, and longtail tuna. By distribution channel, the market is segmented as direct and indirect. Furthermore, by indirect channel, the market is segmented as hypermarkets/supermarkets, specialty stores, online channels, convenience stores, and others. By end use, the market is segmented as foodservice and households. On the basis of region, the market in Europe is anticipated to dominate the global canned tuna market both in terms of value and volume in 2017. North America is expected to gain significant market share in revenue terms by 2025 end. This trend is attributed to the consumer dependence on canned tuna as demand for processed and ready-to-eat food is growing in this region. Moreover, BENELUX is projected to exhibit significant CAGR in terms of value during the forecast period. The growth of the ready-to-eat and easy-to-cook value added tuna market is evident, and there is an increasing demand for super-frozen tunas in the high-end European markets. Super-frozen tuna is mainly consumed in a Japanese delicacy - sashimi. In order to accommodate the supply and demand for super-frozen tuna, the canned tuna supply chain in Europe is improving, which will steadily lead to an increased volume of super-frozen tuna in the European market. Super-frozen canned tuna is available at relatively higher rates as compared to regular canned tuna but as consumers in this region are willing to experiment with new products and are also ready to pay higher prices for the same, super-frozen tuna is expected to fuel the growth of the canned tuna market in this region. Overfishing has led governments to ban commercial fishing in specific parts of the Pacific Ocean. The ban on fishing has led to curtailed supply of tuna, consequently leading to higher prices of canned tuna. Higher prices have, in turn, led to lower demand for canned tuna from regions such as Europe. Tuna species such as yellowfin are overfished and have already been categorized as an endangered species. Concerns against overfishing are growing, leading to the fluctuating supply and demand of canned seafood, globally. In the U.S., the canned seafood market is also indicating a clear downward trend due to the lack of sustainable and regular supply of its main product. Consumers in the U.S. and Europe are highly concerned about dolphin deaths caused due to tuna fishing. A vast number of dolphins have been killed during tuna fishing, and consumers are averse to buying products that have resulted in the deaths of this large by catch. Consumer sensitivity towards the sustainability of canned tuna dictates the growth of the market. The dolphin safety issue has been trending in the canned tuna market over the past many years and is still a major obstacle being blamed for the decline of the canned tuna market. Some of the major companies operating in the global Canned Tuna market are Thai Union Group, Alliance Select Foods International, Inc., Ocean Brands GP, Bumble Bee Foods, LLC, StarKist Co., Raincoast Trading Company, Princes Group, Golden Prize Canning Co., Ltd., PT. Aneka Tuna Indonesia., Wild Planet Foods Inc.., Hi-Q Food Products Co., Ltd., American Tuna Inc., Safcol Australia Pty. Ltd., Conga Foods Pty Ltd, Millaton Fishery Co. Ltd., Sadr Darya Co., Dorj Group Companies, Tohfe Food Product Company, C-Food International LLC and Pegasusfood Co., Ltd. This report provides forecast and analysis of the global Canned Tuna market. It provides historical data of 2015 along with estimated data of 2017, and forecast data up to 2025 in terms of revenue (US$ Mn). The report also includes macroeconomic indicators along with an outlook on Canned Tuna for global market. It includes drivers and restraints of the global Canned Tuna market and their impact on each region during the forecast period. The report also comprises the study of current issues with consumers and opportunities for Canned Tuna products. It also includes value chain analysis. In order to provide users of this report with comprehensive view of the market, we have included detailed competitiveness analysis and market key players and strategy overview. The dashboard provides detailed comparison of Canned Tuna manufacturers on parameters such as total revenue, product offerings, and key strategy. The study encompasses market attractiveness analysis by species type, distribution channel, end-use and region. The report includes Canned Tuna market company profiles and the revenue generated from the companies across North America, Latin America, Europe, APAC, and MEA. By species type, the global Canned Tuna market is segmented as albacore, yellowfin tuna, skipjack tuna, Bluefin tuna, bigeye tuna and longtail tuna. By distribution channel, the market is segmented as direct and indirect. Furthermore, by end use, the market is segmented as foodservice and households. For the calculation of revenue collection of average regional prices were obtained through primary quotes from numerous canned Tuna manufacturers, retailers and distributors. All key end users have been considered and potential applications have been estimated on the basis of secondary sources and feedback from primary respondents. Country demand patterns have been considered while estimating the market for various end users of canned tuna in the different regions. Top-down approach has been used to estimate the canned tuna market by countries. Global market numbers by species type has been derived using the bottom-up approach, which is cumulative of each country’s demand. Company-level market share has been derived on the basis of canned tuna penetration. The market has been forecast based on constant currency rates. A number of primary and secondary sources were consulted during the course of the study. Secondary sources include Factiva, and Hoover’s, and company annual reports and publications. The report provides detailed competitive and company profiles of key participants operating in the global market. Some of the major companies operating in the global Canned Tuna market are Thai Union Group, Alliance Select Foods International, Inc., Ocean Brands GP, Bumble Bee Foods, LLC, StarKist Co., Raincoast Trading Company, Princes Group, Golden Prize Canning Co., Ltd., PT. Aneka Tuna Indonesia., Wild Planet Foods Inc.., Hi-Q Food Products Co., Ltd., American Tuna Inc., Safcol Australia Pty. Ltd., Conga Foods Pty Ltd, Millaton Fishery Co. Ltd., Sadr Darya Co., Dorj Group Companies, Tohfe Food Product Company, C-Food International LLC, and Pegasusfood Co., Ltd.